Normally I would say a shooter that pits the player against an armour-plated hot air balloon would instantly earn its place among the greats, but the Master System version of G-LOC was probably a disaster waiting to happen for a couple of reasons. For one, there was the console it was being produced for. In December 1991 the Master System was in a weird place. Long discontinued in its Japanese homeland and on the verge of expiration in the US, the console managed to continue soldiering on in the relatively small markets of Europe. Awkwardly, the games designers were creating something that would never see the light of day in their homeland. On top of that, G-LOC was not an obvious title to port to home machines. Built around the latest swanky 32-bit arcade technology and sporting a cool gyroscopic deluxe cabinet that rotated the player through 360 degrees, G-LOC was an arcade game that was sustained much more by the overall effect of the experience than any sophistication of the underlying game design. Mind you, today is “review a great game day” and we naturally wouldn’t be looking at Master System G-LOC if it was terrible, would we? It may not come as much as a surprise, then, the Master System port doesn’t just live up to the original, but actually surpasses it. How so? Well interestingly, it seems that the planners behind the Master System seem to have taken the simplistic formula of the original game and seen it as spring board rather than a constraint. Like its’ (unofficial) predecessor Afterburner II, arcade G-Loc is a very simple game: parked behind the controls of a sophisticated jet fighter, it’s the player’s job to scream from one attractive landscape to the next, blasting badguys as they go. Indeed, technology and first person perspective aside, the only major differences between G-LOC and Afterburner was that the former introduced harsh quotas of targets for the player to destroy, and punishing time limits within which the player had to meet them. Now, when it comes to the core gameplay, Master System G-LOC doesn’t actually stray too far from this basic template: the player is given a target quote, a time limit and then left to get on with things as their plane flies across an endless scrolling landscape. What makes Master System G-LOC so much different is it has an important card up its sleeve: context. Yes, the missions might be broadly the same, but the core gameplay of Master System G-LOC is bookended in elements that seem pinched straight from an RPG. 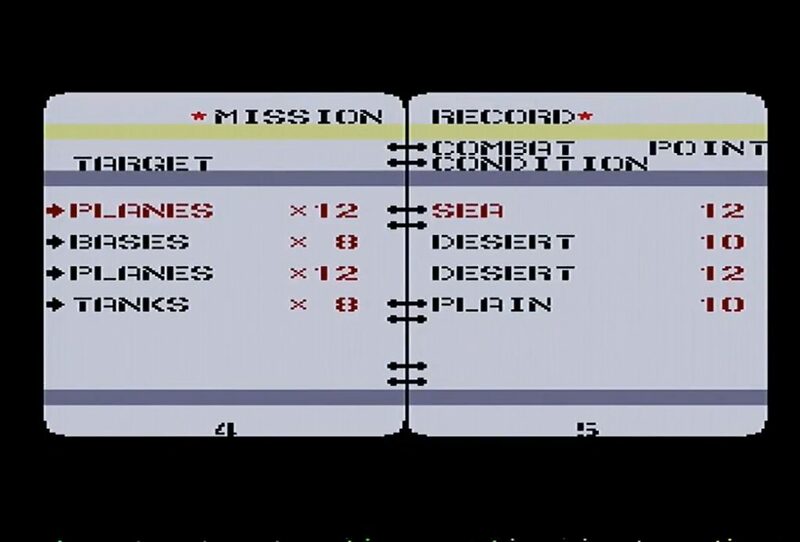 Where the original arcade game merely leads the player through a linear chain of assignments that have no real link to one another, in Master System G-LOC the player is presented with a mission book and a number of important choices that have to be made before they can take to the skies. For one, there’s which mission to undertake. Each choice has a different enemy type, location and target quota and will reward the player with a differing amount of points based on its’ difficulty. Before they take off, the player can use these points to both repair their plane and buy extra time and missiles. They have to chose carefully, mind you, as the player has to save up a certain number of points in order to “buy” the final mission in the game, so its important for them to not spend everything they earn. This gambling element adds a much needed element of strategy to what is essentially a very simple game. Is it best to stick to an easier mission and accept a smaller reward? or should you be more ambitious and risk being lumped with a more expensive repair bill and a shorter amount of time on the clock? Master system G-LOC has a better setup then the arcade then, but how does it play? the handling model found in G-LOC is definitely an interesting one. While the arcade original offers three different sets of flight mechanics based on the chosen game difficulty, the Master Systen version has a single set which attempt to balance some elements of realism with a full-on arcade experience. In practice, this means that while the flightstick handles realistically (you have to roll the plane and pitch up and down in order to move from side to side) the player has no control of the vehicles’ speed, and it’s also impossible for the plane to fly into the ground. When it comes to taking down those “bogies,” the combat controls have a similar balance. While in the original arcade machine the player’s jet could only achieve a missile lock on one target at a time (and even then, the player had to keep their quarry in view for a few agonising seconds,) in the Master System version the player’s plane has an instant lock on any target in view. Its a war balloon. A war. Balloon. That’s not to say that the shooting is all easy-peasy. Any Player who wants to save their missiles will find their jet’s cannons to be particularly unforgiving. Though the target reticle gives the player some guidance as to how gravity is likely to affect their shot, there is no real aim assistance to speak of, and It’s entirely up to the player to make their shots count. This is an interesting and welcome mish-mash of characteristics then. While the lack of air speed and crash mechanics lays the game’s arcade origins pretty bare, the complexities of the pitch, roll and targeting mechanics combine with the forced first-person perspective to, at least, give the impression of a semi-authentic flight experience. That’s not to say that G-LOC takes itself massively seriously as a simulation. One of the most technically demanding aspects of the original arcade game was the inclusion of a number of intense canyon missions that forced the player to target enemies whilst simultaneously having to avoid a fiery, rocky doom. Rather than try to reinterpret this technical feat on Sega’s rapidly-ageing hardware, the designers came up with a different way of breaking the monotony of the main game loop: Boss battles. Switching up to a more arcade style of control, the boss battles in G-LOC put the player up against a single rock-hard opponent who can both take a lot punishment and send an unfeasibly large amount of missiles the player’s way to boot. I’m not sure whose idea it was to put a steel hot air balloon in the game – and i’m equally not sure how good their grasp of physics is either – but i’m glad they did. The boss battles are the cherry on top of a surprisingly tasty sundae. They are challenging without being unforgiving, and inevitably turn up just as things might be getting a bit repetitive and dull. They definitely don’t really fit in with the original arcade or the wider content of the game, but they absolutely make it. They are great. There are plenty of nice touches other than the boss battles as well. Though the strobing terrain sets are completely devoid of ambient objects, both the enemy sprites and the player’s cockpit are nicely drawn with a fair degree of detail. Indeed, the cockpit’s radar is both fully functional and a necessity if the player wants to keep track of what’s around them. In fact they ignore it at their peril: if an enemy plane successfully sneaks up on the player the camera zooms into the cockpit of the assailant, triggering a first (well, second?) Person mini game where the player has to roll and wriggle their way out of the enemy’s target reticle in order to survive. The sound deserves a mention too. Though Sega had already stopped writing soundtracks for FM-equipped master systems by the time G-LOC was germinating, the Master System soundtrack is nonetheless a decent PSG rendition of tracks found in the arcade original. You probably won’t be humming the tracks for the next month, but they do a good job supporting the action happening on screen, which is all you can ask from a soundtrack, really. G-LOC, for me, is the very definition of a hidden gem then. Though you won’t find many people recommending it – it’s hard enough finding someone whose even played it – the skillful way in which its’ designers melded elements of arcade and flight simulation with RPG-style progression definitely means this one deserves a second look. Though remarkably short (if you know what you’re doing the game can be completed in around 15 minutes – a perfect arcade game length) the game is filled with enough joyful flourishes and addictive arcade touches to keep you coming back in those spare 15 minutes where you really just feel like shooting some things. 8 bit, Arcade, flight sim, g-loc, Master System, RAGGD. Red Two, we have a squadron of puns at 3,000 thousand feet. Move to intercept. Actually, very interesting review. The G-LOC experience was all about the cabinet throwing you around, so expanding the home version makes sense.